Read the “Gartner Critical Capabilities for Cloud HCM Suites for Midmarket and Large Enterprises, 2018” report. 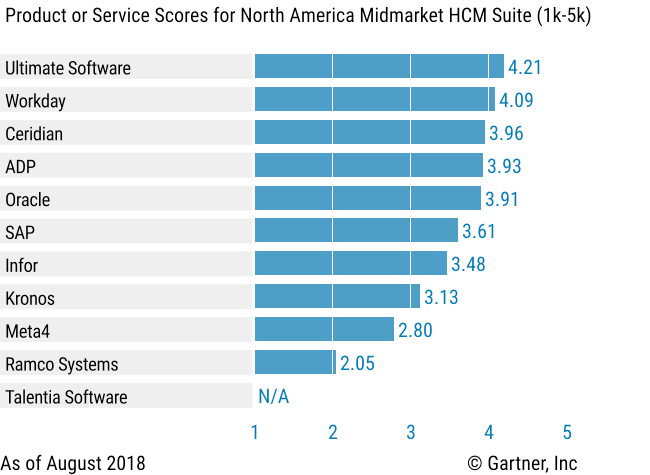 We are confident that Ultimate’s customers were key factors in achieving the highest ranking among all vendors for the North American Midmarket HCM Suite (1k - 5k) use case, and second highest ranking for the North American Admin, Compliance Suite, hourly workers (>1k) use cases. Read the report to learn more on our ratings.